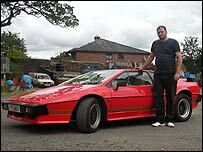 A sports car enthusiast who suffered a mini stroke while restoring a Lotus Esprit was amazed when online friends finished the work for him in secret. Simon Pritchard, 36, from Abergavenny, had been in the process of rebuilding the 25-year-old car when he fell ill. When members of the Lotus Esprit online forum website heard, they donated money and time to fix it. The original 18-month project costing £25,000 actually took his friends just five weeks to complete. Mr Pritchard had several mini strokes after developing Reiter's Syndrome - a form of arthritis which develops as a reaction to infections in the body. He also suffers from a lung complaint. But despite his illness, he was determined to lead as full a life as possible and wanted to restore the classic. As part of his research, he logged onto a website which allowed people to get help and advice in the restoration of such cars. Andy Betts, from Bexley, Greater London, who runs the website said: "He was trying to do up the car even though he was quite unwell. "One day I phoned him up and his wife said he was in hospital and I thought that there had to be something we could do to help him." So while Mr Pritchard recovered in hospital, Mr Betts set up an area on the website which Mr Pritchard was denied access to and went about recruiting help from the 3,800 members. Offers of money, car parts and time soon came flooding in and so with the help of Mr Pritchard's wife Kelly, the group organised to have the car taken to a garage in nearby Caerphilly for restoration. Over the next five weeks, more than 2,000 hours of work were put in by people who travelled from as far as Hertfordshire, Cheshire and Kent. 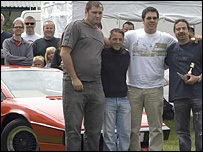 Money was also donated from as far away as the United States and, with the Lotus car company's help and support, Mr Pritchard's car was finally restored to its former glory. "I thought my car was in Troy Halliday's garage in Hertfordshire," said Mr Pritchard. "Troy had said he was going to have a go at getting the engine up and running and had picked up the car. "But what I didn't know is that it wasn't in Hertfordshire at all, it was just 20 miles away in Caerphilly." After a plan involving hundreds of people, Mr Pritchard was finally reunited with his car at a Club Lotus annual track day at Castle Combe in Wiltshire. "I was led to the pit fence and everybody was around," said Mr Pritchard. "There were two red cars coming down the track. It was only when they stopped by the fence that I saw the number plate and realised. "I was so overwhelmed, I cried like a baby and then passed out. "I can't even begin to thank all the people who were involved. It just restores your faith in people and shows that there is good in everybody," he said.